When US Ambassador to India Timothy Roemer next meets US President Barack Obama at the White House, they'll have a lot to discuss: Among other things, Indo-US political and economic relations, South Asian security issues and how to best give India access to Pakistani-American David Headley. But, according to Roemer himself, there's one thing he plans to mention before all else: basketball! "I look forward to telling Barack Obama that some of the best basketball on the planet is played right here in Mumbai!" Roemer told an enthusiastic crowd at the YMCA in Nagpada, Mumbai. He was there to promote a youth basketball league, and said that sports are a very useful way to bring people together across divides of class, gender and religion. 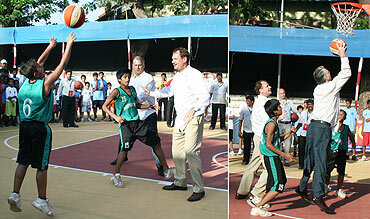 In addition to giving some on-the-court and off-the-court advice, the ambassador and his Mumbai steward, US Consul General in Mumbai, Paul Folmsbee, also played a pick-up game with two Mumbai-area youngsters. "It was a blast," said Folmsbee. "The ambassador and I had a great time." 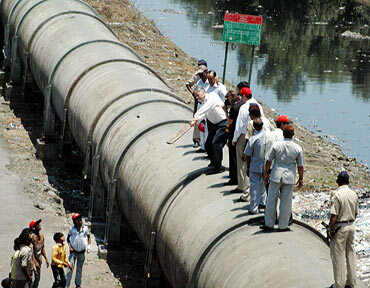 But Roemer's third visit to Mumbai wasn't only about fun. 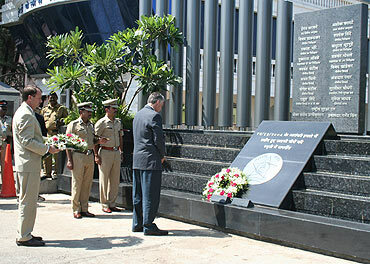 Earlier in the day, he visited the memorial for 26/11 victims outside the Mumbai Police Gymkhana on Marine Drive. After placing garlands of flowers atop the memorial and offering a brief moment of silent contemplation, Roemer reiterated the recent strong stance taken towards Pakistan by the US state department, marked by US Secretary of State Hillary Clinton's tough words for Islamabad in the wake of the arrest of Pakistani-American Faisal Shahzad for the attempted Times Square bombing. 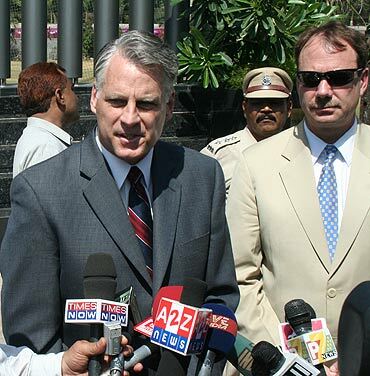 While conceding that fighting terrorism remains a "tough challenge" for both US and India, Roemer said that the two countries would continue to work together, in new and more intimate ways, to bring to justice perpetrators of attacks like 26/11 in Mumbai and 2001's 9/11 in New York. Roemer called India an "indispensable ally" and assured that US-India strategic cooperation would only increase in future years. He also mentioned David Headley, the Pakistani-American Lashkar-e-Tayiba operative convicted of his role in planning the 26/11 attacks, and said that the US was working on an unprecedented manoeuvre to grant India access to him at an "appropriate time" in an "appropriate way". In adding that a partnership with India is critical to the US's aims in South Asia, Roemer said that India and the US had many similar interests, including peace and prosperity in Afghanistan. On Pakistan, while explaining that Islamabad had done much to curb terror spawning from its own soil, the ambassador maintained that the government there must to more to crack down on extremism and militancy. He added that it appears Pakistan has come to realise the very serious threat posed by home-grown militants. Earlier in the day, Roemer had also visited Dharavi, a sprawling slum in central Mumbai, where he got a chance to see how India's other half lives. After playing some gully cricket with a few local boys, he mentioned that, in the wake of his Dharavi experiences, he realised anew how important economic security is for peace and stability in South Asia. Ahead of his visit to Mumbai, Roemer penned an op-ed, published by an Indian daily, in which he praised the spirit of the city, paying particular attention to the brave victims of 26/11. He said he stayed in the Taj Mahal Palace and Tower as a way to show solidarity with such an iconic and legendary Mumbai institution. Last May, Barack Obama nominated Roemer, a former representative in the US Congress and an international security expert, to be America's ambassador to Delhi.